All I can say about this morning is that it was a Wow EXPERIENCE! What a wonderful networking event at Bredasdorp Square! 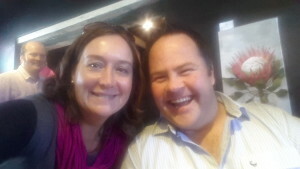 Kobus I personally will now endeavour to give my clients a better package inside and out after your inspirational talk! Thank you Juanita for excellent hospitality, food and service! Great prizes thanks to our generous sponsors and of course it is each of you that make our events as special as they are!! Look out for our blog that will give more detail about Kobus Tollig‘s talk and how you too can build a successful business in the platteland. Thank you Kobus for taking time to share your knowledge and experience with us! You can do it! Aanhouer Wen! Where do you start? With marketing yourself in your community and ONLINE. Networking is most important for your business. Be generous with ‘extra services’ that you can offer. Be careful of your Attitude .. always be positive. Competition is healthy – relate to them and make friends with them. Always deliver a good service. Know your product. Know your market. Know where you’re going. Surprise your Customer – give them an EXPERIENCE.